The silent film Metropolis, directed by Fritz Lang and his wife was a ground breaking masterpiece and the first science fiction ever made. Produced in 1927 in Germany during the Weimar Period, Metropolis is set in a futuristic urban setting and portrays the attempts of Freder, the wealthy son of the city's ruler, and Maria, a poor worker, to overcome the vast gulf separating the upper and lower classes of their city. Filming took place in 1925 at a cost of approximately five million Reichsmarks, making it the most expensive film ever released up to that point. 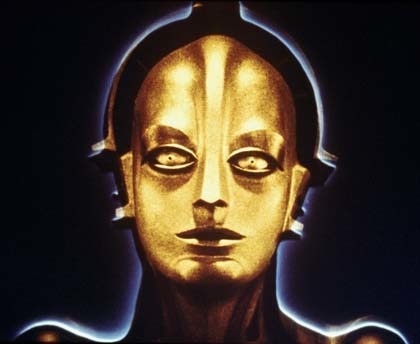 One of the most notable characters of this visual spectacle was Maria, the "False Robot" of Metropolis. Using the plaster body cast of the actress, Mittendorff cut large chunks of plastic wood, rolled flat with a pin and draped them over the cast, like pieces of a suit of armour. The resulting costume was then spray-painted with cellon varnish spray mixed with silvery bronze powder which gave it a very convincing appearance of polished metal. The description in the original film script makes an analogy to an Egyptian statue. Helm often sustained cuts and bruises while in character as the robot since the costume was very rigid and uncomfortable. Prop technicians had to use a sling or harness made of rope and pulleys to help left Maria off of her "throne" when shooting of the movie had ended for day. 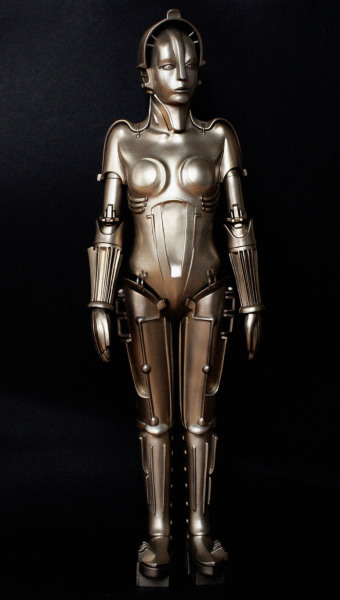 It is widely believed that George Lucas was inspired by Maria the Robot when he conceived the protocol droid C3P0 for the original Star Wars. 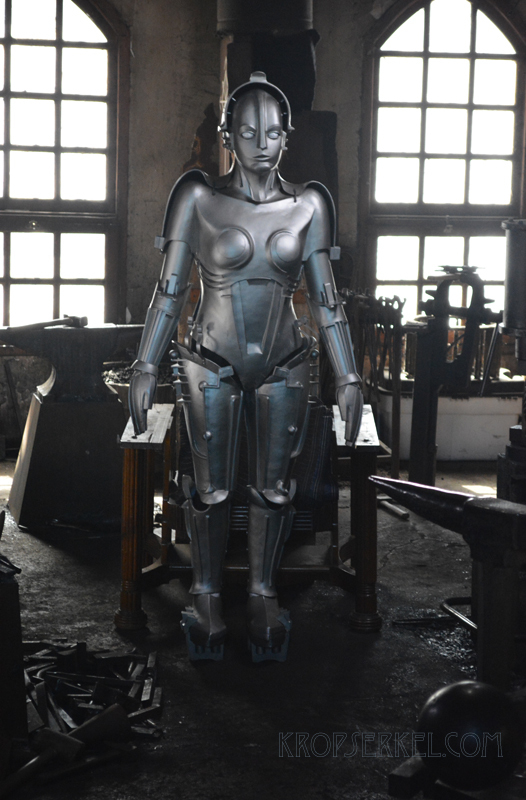 In 1984, Masudaya produced a one fifth scale replica of Maria of Metropolis. The original statue was made from a semi-hard vinyl material and stood on a black plastic/rubber pedestal 17.5 inches tall. The pedestal features two LED lights projecting upwards that give the statue an eery if not mesmerizing appearance in the dark. The statue is very well detailed and has articulated elbows, knees and the upper torso swivels back and forth. We originally purchased our kit for $75.00 about fifteen years ago and have not touched it until now. The kit is long out of production and any remaining "new in the box" examples of this impressive statue are selling for as high as $500.00. Wow. ​​At first glance, our robot is really not too bad in terms of details and accuracy to the original movie. However, after examining our gynoid friend we definitely see opportunities for improvement. The loops or straps that connect her torso or breastplate to her legs need help as do the square hooks on both of her sides. The pins that hold her arms together at the elbow are unsightly and the statue really begs for an authentic looking metallic paint job. Finally, the stand is pretty dull looking and would benefit from a weathered metallic look highlighting the nameplate on the top. We can do this. Please note that this photo was taken of another statue restoration in progress. Our ultimate goal is to duplicate some of the modifications that this modeler is performing on his/her statue.